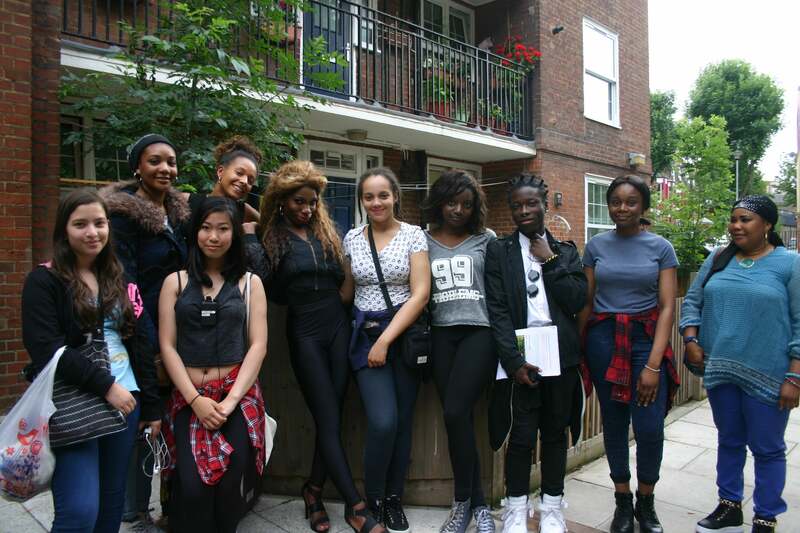 Michaela Coel, who wrote and stars in Chewing Gum, starting on E4 tonight, invited young Islingtonians on to the set, during filming on the Andover Estate. Ten young people involved in the local performance organisation Platform spent time behind the scenes, learning how the filming process worked. And then, were invited to a question and answer session, where Michaela Coel was able to explain the long process of bringing her character Tracey Gordon to TV screens. The six-part series starts on Tuesday October 6th. Here’s the trailer. FilmFixer director Andrew Pavord congratulated the production for the generosity of their time with young people, saying, “It means a lot to see a big, national show like this coming together in your neighbourhood, on your estate. Chewing Gum is set in Tower Hamlets, on an estate a lot like the one Michaela Coel really grew up on. Islington’s Andover Estate residents stepped up to welcome the production in June this year, providing behind the scenes facilities for the cast and crew, while their home played its on screen role. A pilot for the series also filmed on Lambeth’s Brandon Estate, making a donation to residents to thank them afterwards. Coel’s character, Tracey Gordon, is fast-talking, religious, obsessed with Beyonce, eternally optimistic and trying to find something more in her life.